Space debris has hit the entertainment headlines recently, with the film Gravity winning various awards; it deals with the aftermath of a space debris collision with the International Space Station. So is the film just a fictional thriller or a prophetic warning? 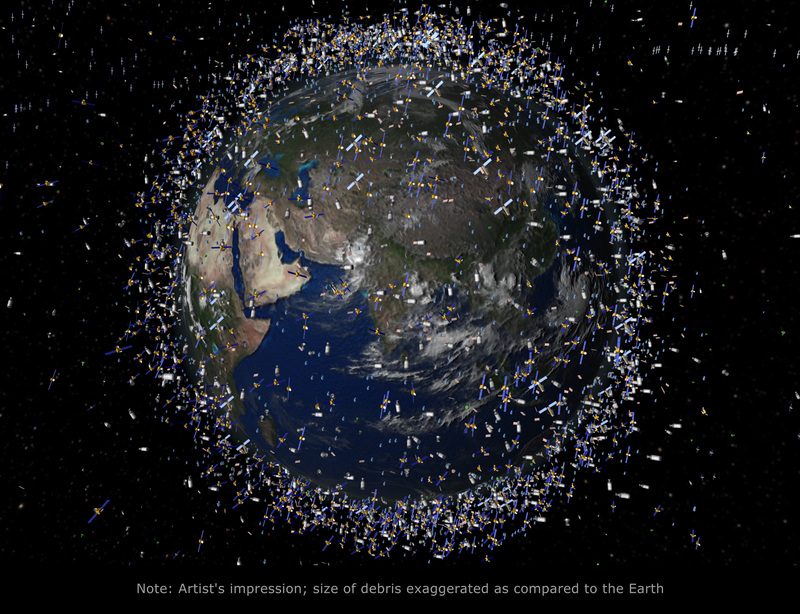 Our recent blog noted there are currently almost 4,000 satellites in orbit; of which almost 1,200 are operational, leaving 2,800 pieces of junk metal up there. However space debris, sometimes called orbital debris or space junk, is far wider than simply old satellites; it encompasses every man-made object circling the earth. It includes upper rocket stages, results of anti-satellite weapon testing, solid rocket motor waste and anything that has broken off any satellite or spacecraft. It also includes less obvious items that have been ‘lost’ in space including a camera, a tool bag, single glove, pair of pliers and a spatula – although some of these did burn up! There is also the less tasteful astronaut urine, which for many years was dumped into space. In total the U.S. Space Surveillance Network estimates that there are more than 21,000 pieces of space debris larger than 10cm, 500,000 pieces between 1cm and 10cm in size and 100 million pieces smaller than 1cm; all of which add up to a mass of around 6,500 tonnes orbiting the planet. Most of the debris is at altitudes of less than 2,000km, which co-insides with the height of low earth orbits accounting for fifty percent of all active satellites. With the debris travelling at speeds up to 33,500 miles per hour, any collision is serious. The danger was demonstrated with the recent deployment of ESA’s Sentinel-1 satellite. Less than 24 hours after launch there was a warning that the low earth orbit NASA satellite, ACRIMSAT, had run out of fuel, could no longer be manoeuvred and was on a potential collision course. Sentinel-1 required an immediate manoeuvre to alter its orbital altitude – something the launch team hadn’t anticipated! In addition to active satellites, the International Space Station regularly has to alter its orbit to avoid space debris. 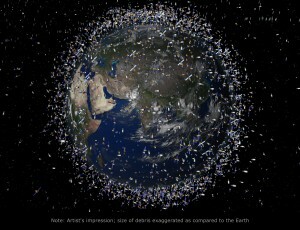 As more satellites are launched, last year was the greatest number in history, the potential for space debris increases. Scientists warn of the Kessler Syndrome, a scenario where the high density of objects in low earth orbit causes a cascade of collisions creating so much debris it becomes impossible to launch anything successfully into space. In our clamour to have more robust positioning and tracking and a wider variety of sensing options, we need to consider the future. End of life solutions must be given as much attention as the launch; to ensure our industry continues to develop, and grow, for the future generations of Earth Observation scientists. This entry was posted in Copernicus, Earth Observation, ESA, Space Industry, Understanding Space, visualisation and tagged Earth Observation, ESA, Gravity, Kessler Syndrome, pixalytics, Satellites, Sentinel-1, Space debris by Andy. Bookmark the permalink.